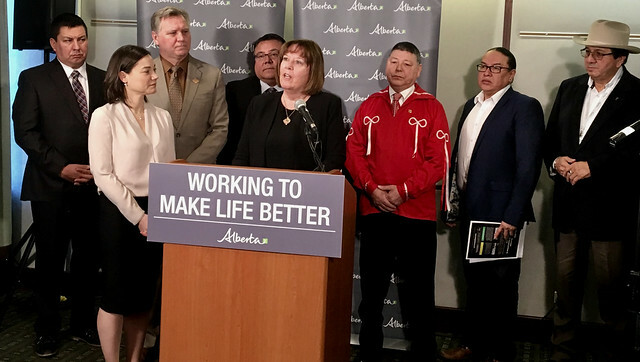 L-R: Guy Lonechild, CEO, First Nations Power Authority, Minister Phillips, Minister Feehan, Rupert Meneen, Grand Chief, Treaty 8, Minister McCuaig-Boyd, Gerald Cunningham, president, Metis Settlements General Council, Aaron Young, Chief, Chiniki First Nation and Roy Fox, Chief, Kainai First Nation. The highly competitive first round attracted private investment from Alberta and around the world, with successful bidders to provide 600 megawatts of renewable electricity to the grid by the end of 2019. Support for the Renewable Electricity Program is made possible by the Climate Leadership Plan and is not funded by consumer electricity charges. In total, the program will support the development of 5,000 megawatts of renewable electricity capacity to reach a target of 30 per cent renewable energy by 2030.